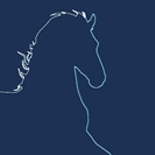 On Saturday November the 24th six stallions successfully completed the Central Examination in Exloo and were registered in the Studbook. Quite remarkable is the influence of Norbert son Hette 481 who had two sons approved: Willem 508 and Wardy 509. Ulbe 506 and Yme 507 were both bred in Denmark and were loudly cheered by a large flock of Danish fans when they were decked out with red-white sashes for the in-hand presentation. Because of their age 4-year-olds Teun 505 and Matthys 504 have the lowest numbers of this collection. Through Chairman Harry Draaijer the Stallion Inspection Committee pronounced to be very content with this new batch of six stallions. ‘A solid collection of stallions with good trainability and a hard-working attitude.’ Prior to the moment of honouring breeders and owners, head of training Koos Naber, stable master Jessica Klaassens, drivers Ito Werkman and Udo de Haan and the rider team consisting of Judith Pietersen, Jakob van der Heide and Ludo van der Weide received a word of thanks from KFPS Chairman Bert Wassenaar. In July the instruction days started out with 32 stallions, which culminated in a new year collection of six stallions. From this original group 15 stallions arrived at the examination location in September. 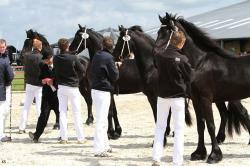 On October the 27th ten stallions took part in the final riding horse assessment. The six stallions that continued the examination after that were registered in the Studbook today. Attracting strong public interest, the stallions were presented outdoors in the showdriving test and indoors in the driving test. Matthys 504 is a 6-year-old son by Norbert 444 out of a Beart 411 daughter. This results in a high kinship percentage which means that in combination with a relatively large number of mares the match will produce a high inbreeding percentage. His dam is a first-premium Star mare with so far three Star offspring. Next in his dam line (pedigree 2) we find a Star mare by Krist 358 and a Model mare by Leffert 306. Higher up in the dam line we come across the well-known Model Preferent Ritske 202 daughter Zierda. 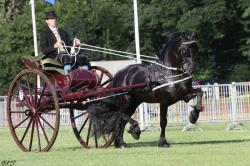 Matthys 504 catches the eye with his self-carriage and his good trot and extra canter. In front of the carriage he stood out because of his use of the foreleg and front. Teun 505 is a 4-year-old Bartele 472 son out of a Star mare by Rindert 406 who so far has three Star offspring. His granddam is a Model Sport Preferent mare by Fabe 348. His greatgranddam (3rd dam) is the famous Feitse 293 daughter Setske F. This Setske F. is Star, Preferent and Performance, has as many as thirteen Star offspring and is for instance dam to the Preferent Beart 411. Teun 505 is a stallion with great movement technique and good posture who received high marks for trot and canter in all three disciplines. In the course of the examination Teun 505 has made a lot of progress. Being a son of Anders 451 stallion Ulbe 506 has a relatively low kinship percentage. This is consolidated by the fact that he is unconnected to the influential stallions Feitse 293, Leffert 306, Jasper 366 and Reitse 272. Ulbe 506 was bred in Denmark out of a Star Preferent daughter by Anton 343. Next in the dam line (pedigree 10) we find Star Preferent daughters by, respectively, Hearke 254 and Cobus 248. During the examination Ulbe 507 has shown to be very constant in all three disciplines and moves with a good technique. He has very good trainability and gives his riders/drivers a good feeling. Yme 507 is a 3-year-old son by Tsjalle 454. He was bred in Denmark from a mare line which is based on stallions that have had relatively little influence on breeding. His dam is a Model mare by Bente 412 who also has the Sport predicate. His granddam, a Wierd 409 daughter, also has the Model predicate as well as Preferent status. His 3rd dam is a Star mare by Oltman 317 with three Star offspring. The 4th mare in the mare line is the famous Jakob 302 daughter Beitske fan Marksathe. She is Star Preferent and Performance and can boast eleven Star offspring. These horses from pedigree 25 stem from the same line as the Preferent Norbert 444. Yme 507 is a diligent stallion with good body posture who canters with a lot of balance, impulsion and technique. Under saddle he trots with an eye-catching technique. Willem 508 is a 3-year-old son from Hette 481´s first crop. His dam is a Star mare by Folkert 353 with three Star offspring. His granddam is a Star mare by Tsjomme 329 with two Star offspring, with his 3rd dam being a Model mare who also has two Star offspring, by Oege 267. Willem stems from pedigree 61 from which we also know stallions like Tamme, Tjimme and Wicher. Willem came to the Central Examination by way of the ABFP Test from last spring. In the Central Examination Willem 508 scored well on his suppleness and good ground coverage in movement. In under-saddle work as well as in driven work he demonstrated a good walk and left a positive impression with the guest riders- and drivers. Wardy 509´s pedigree unites two of the most prominent showdriving lines. On the maternal side these are the showdriving mares of pedigree 8. His sire Hette 481 harks back to the famous mares Fabiolaa and Ljurkje who produced the brothers Ulke 338 and Karel 370. His dam is the by now 18-year-old, excellently preserved Goffert 369 daughter Annigjen who flaunts the predicates Star, Preferent and Performance. She has seven Star offspring, with one Crown, one Model and two Sport offspring among them. 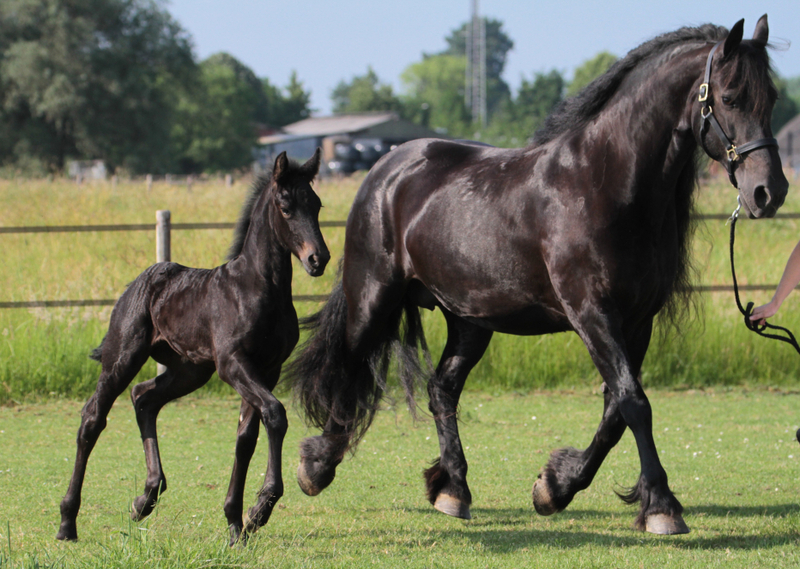 The most well-known offspring are the approved Maeije 440 and the multiple National Champion broodmares in front of the sjees: Ytsjen Model Sport. Wardy’s granddam is a Model Sport mare by Feitse 293 and his great granddam is a Star, double Preferent Performance mare by Hearke 254. As could be expected with such a lineage, Wardy 509 gave a convincing performance in the showdriving test in which he displayed great technique. The stallion catches the eye with his attitude and forward-going activity. In all three disciplines he scored over 82 points.